Varied and cozy through forests and over meadows. Great views, varied nature and small playgrounds along the way with refreshments. 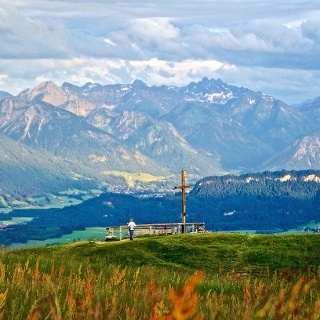 An appealing hike through forests and and over meadows is waiting for you in Ofterschwang. Plenty of beautiful nature makes the tour a hiker's experience for the whole family. 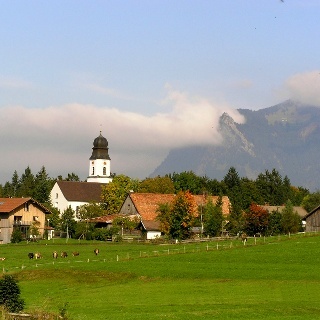 On the nature trail you will find exciting information about the origins and cultivation alpine landscape of the Allgäu. From the parking at the valley station of the cable car in Ofterschwang, the path leads via the nature trail to Hüttenberg. From here you go uphill passing "Alpe Eck" and the huts Hochbichl and Wurzelhütte again downhill to the valley station. Tips: Combine the tour with a visit to the mountain-dairy in Hüttenberg - ideal for taking small treats along for the walk. At the Allgäuer Berghof at Alpe Eck, the DiscGolf Parcours invites you to play a round of Discgolf. Here, unlike golfing, a frizbee must be thrown in special baskets. 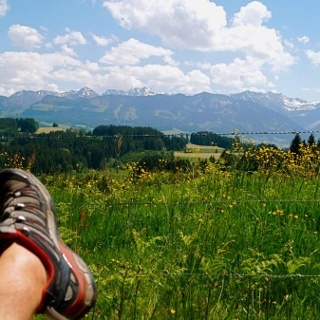 You can relax in the sun on comfortable sofas at the rustic Hochbichl hut - the only alpine hut with outdoor sofas. The "Wurzelhütte" with a cozy restaurant, Schlitte Hitte with its great alpine ambience and the pizzeria in the Ofterschwanger Haus at the base station in Ofterschwang invite you to a cozy stopover. Every Thursday at 10.15 o'clock there is a free tour through the alpine dairy in the Bergbauern-Sennerei Hüttenberg. 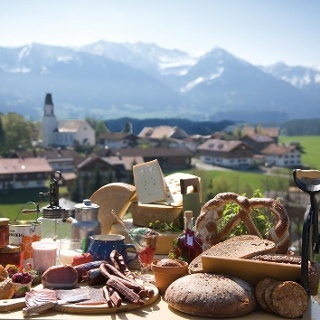 The high-quality alpine milk, the basic product of the famous Allgäu mountain cheese, is made from our succulent green meadows. From the parking at the valley station of the World Cup Express in Ofterschwang, the path leads to the right around the primary school. Follow the sign "Hüttenberg". 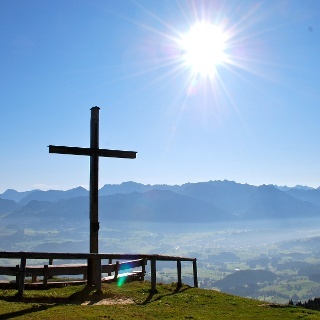 Cross the river, you enter a small settlement and enter the nature trail, which tells interesting facts about the forest, plants and origins of the Allgäu Alps. At the end of the nature trail above Hüttenberg follow the path straight ahead and take the second path on the left to Gunzesried. Magnificent mountain meadows and beautiful forest sections lead up to Gunzesried / Allgäuer Berghof until you finally reach the road. 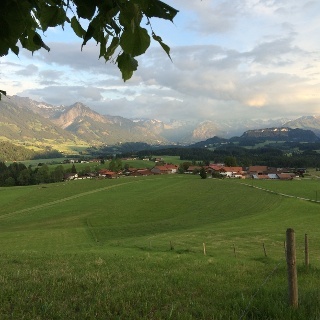 The route continues along the road, past the Kuckucksnest (private) to the Familotel Allgäuer Berghof (no stopover). Here you have a beautiful panorama view into the entire valley. 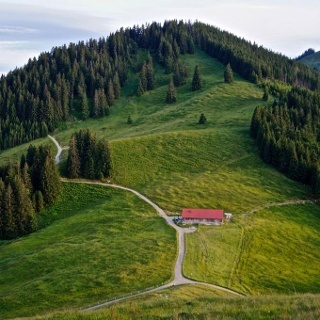 The path leads either left downhill to Ofterschwang, or you pass the hotel and after a small right-left loop to the Hochbichl hut (signposted). From here, go downhill for a short distance and then left-right with the Panoramweg downhill to Ofterschwang. We recommend avoiding the road straight down, because it is quite steep and difficult to walk. Tips: Visit the alpine dairy in Hüttenberg. In addition to fine cheese and delicacies made from fresh hay-milk, you also get hearty sausage specialties from the Butchery (cooperative butcher shop). There is a disc golf course at the Allgäu Berghof. From Thursday to Sunday you can test your luck with Frizbees. Possibility for stop-over: At the valley station you will find the Schlitte Hitte, Pizzeria Cortina and the Wurzelhütte, on the way the Hochbichlhütte. In the summer months, the ice cream shop in the village center of Ofterschwang offers quality homemade ice cream made from our precious milk!